Molecular machines are large and flexible macromolecular assemblies that fulfill a wide range of vital processes in the cell. Understanding how these machines work is a strategic goal in modern molecular biology. However, just like machines from daily life, molecular machines employ movements of separate parts in their functioning. The required intrinsic flexibility for these movements often complicates their structural characterization. Modern electron microscopes allow visualisation of individual assemblies that are frozen in a thin layer of ice and thus free to adopt any functional conformation. 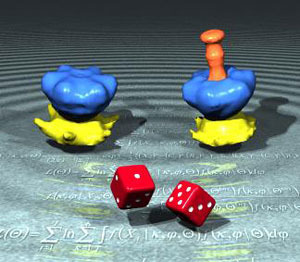 Thereby, provided that images from distinct conformations can be separated in the computer, three-dimensional electron microscopy (3D-EM) may provide structural information from samples with mixtures of different conformations. Multiple structures from a sample of a functioning machine may then be combined into a "3D molecular movie" that may illustrate how it works. We develop methods that allow structural characterisation of functioning molecular machines by 3D-EM. Current efforts are focussed on developing methods that are applicable to relatively small assemblies, so as to include many more potential drug targets. For this, we combine the development of statistical image processing techniques, e.g. maximum likelihood approaches, with novel data collection strategies. J Mol Biol 415: 406-418.